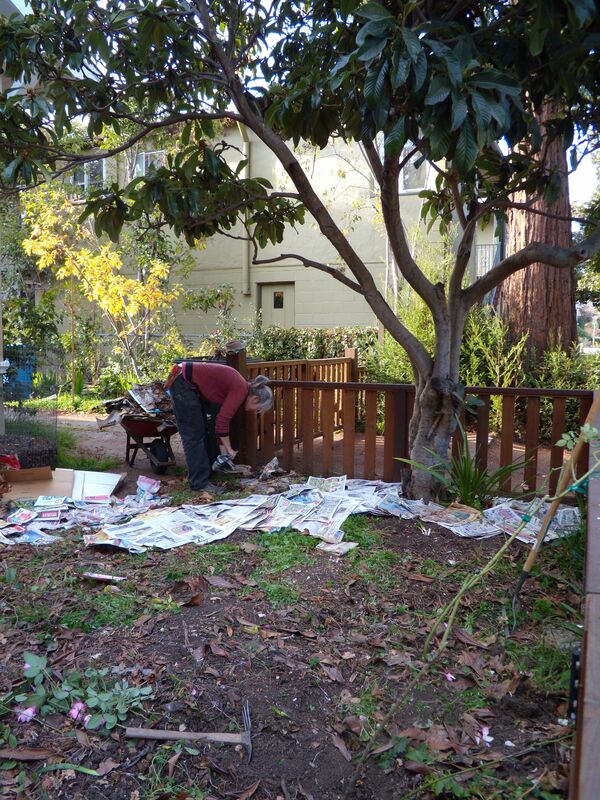 Kelly spreads newspaper under the loquat. We started collecting leaves a year ago in the fall. We made great heaps of them in what we fondly call the orchard––a square little plot sandwiched between the garage and back fence where we always imagine our next garden project will live. We had grand schemes for the leaves, but our eyes were bigger than our rakes. 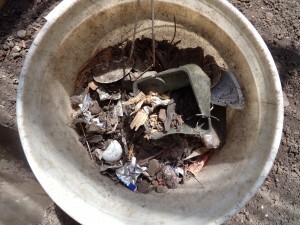 I wanted to make compost piles, and did, much to Kelly’s chagrin. She came home from work one day to discover that I’d used up nearly a quarter of our store. 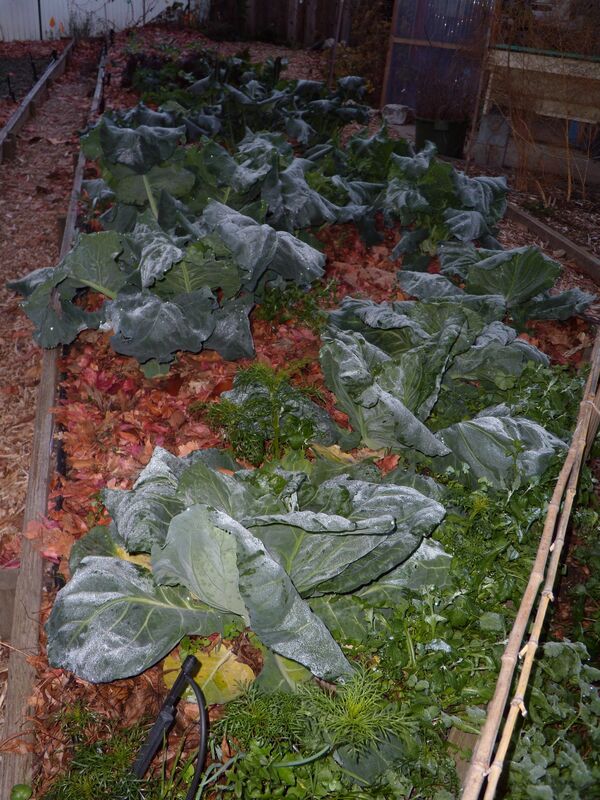 Kelly dreamed of sheet mulching. Done right, the layers of compost, cardboard, and leaves do a great job of building organic matter in the soil and improving water penetration and retention. 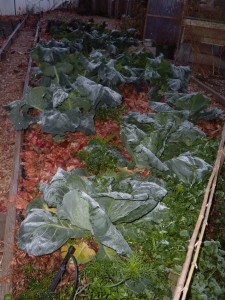 Sheet mulch can also help snuff out annual weeds, a big added benefit in our garden, where we are perpetually behind in our efforts to keep growing space open for the plants we’re actually trying to grow. 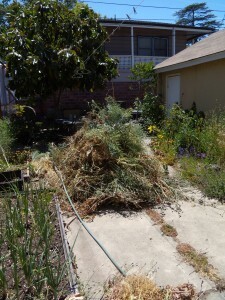 Kelly’s plan went like this: we’d start by mulching the weedy garden paths with layers of cardboard and woodchips supplied by our arborist friend. 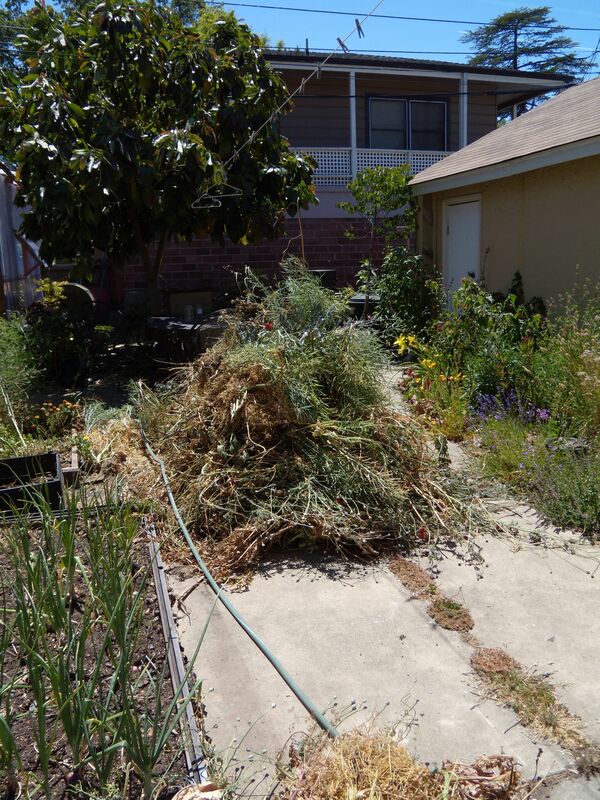 Then we’d work our way around to the front of the house, a no-man’s land of Bermuda grass, ivy, and straggly roses. Finally, we’d circle back along the driveway, filling in compost, cardboard, and leaves under the apple, lemon and persimmon trees. 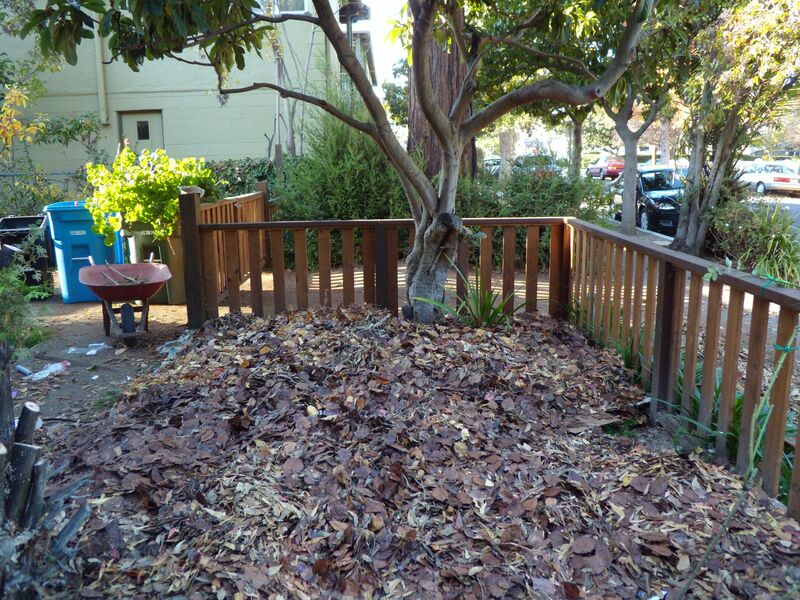 In the end, we ran out of time before we used up our leaves, or woodchips. This year, however, we were at it again. We got an earlier start, enlisted the help of rake-happy neighbors, and befriended a mow-and-blow team one day that gladly dumped a truckload of leaves (mixed with assorted trash) against the front of the house. 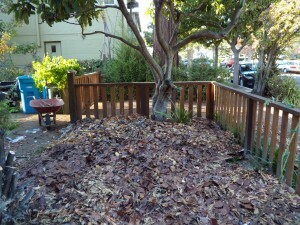 You can’t go far in the garden anymore without tripping over a pile of leaves, and thus the mulch preparation began. You should know two things before I go any further. The first is that we have very little time to work in the garden. We both work more or less full time and we’re chronically overcommitted homebodies. The second thing you should know is that we don’t want to work harder than we have to. We derive immense satisfaction from surveying our handiwork at the end of the day, but we’re often less than enthusiastic about actually starting big projects. That said, we dug out the Bermuda grass and ivy (ha!) in the front yard and removed several stubbornly rooted oak saplings, along with all but the most pleasing straggly rose. In a feat of unparalleled daring (for me), I climbed 25 feet up in an as yet unidentified weed tree and performed some merciless branch removal to bring more light into the front yard. 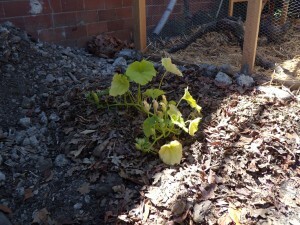 As lazy, cheapskate gardeners lacking adequate resources, we decided to forgo the layer of compost. (We’ll be sure to let you know how this works out.) We went straight to spreading the cardboard instead. We quickly used up our supply of boxes, and resorted to a mat of overlapping newspaper under the loquat. We topped the whole thing off with a generous layer of leaves. Now all we need is the rain. Next fall, when the weeds have (hopefully) been subdued, the leaves and cardboard have broken down into the soil, and the worms have discovered what an awesome place our front yard is to raise a family, we’ll have to come to a joint decision on what to plant. My short-list includes Jerusalem artichokes, blueberries, a raised bed of greens, and space for active compost piles. Kelly is hoping for a home for the ornamentals she loves. To be fair, though, the blueberries were her idea, and she’s even on board with the bed of greens as long as I’m willing to forgo a sunchoke forest and tuck my compost bins around the side of the house.